Witness the fascinating juxtapositions of Southeast Asia, where long-held traditions infuse bustling capitals. See the floating markets of Bangkok with a Thai guide. Marvel at Kuala Lumpur’s soaring Petronas Towers through a local’s eyes. Absorb the vast cultural diversity of Singapore with a resident by your side. 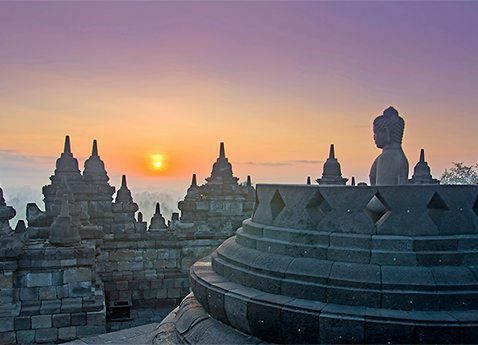 And gain unmatched insight into the spiritual and arts culture of Java, from the enormous temple of Borobudur to the historic riches of Jakarta and Surabaya. Arrive in Bangkok today. Settle in to your veranda stateroom and take time to explore your ship. Because we are berthed overnight in Laem Chabang, you will have much of the day tomorrow to explore the glittering Thai capital. Experience the cultural splendor of Bangkok, beautifully set on the Chao Phraya River. Take your time to enjoy the exquisite flavors of Thailand during a typical lunch. Then take in the other sights and sounds of one of Southeast Asia’s most colorful and cosmopolitan cities on a panoramic tour that includes a stop for an exterior view of the Grand Palace. Admire the city’s many canals plied by traditional longboats and other small vessels. You will occasionally stop for photos as you enjoy the kaleidoscopic scenery. Today you will enter the Gulf of Thailand, the former Gulf of Siam. Long an important waterway for traders and merchants, it has helped shape the economies of Southeast Asia and the Malay Peninsula for centuries. As you cruise, you might enjoy the views from your stateroom’s veranda or from the Infinity Pool. This evening, attend a port talk about your upcoming Thailand ports and enjoy a star-filled night sky. 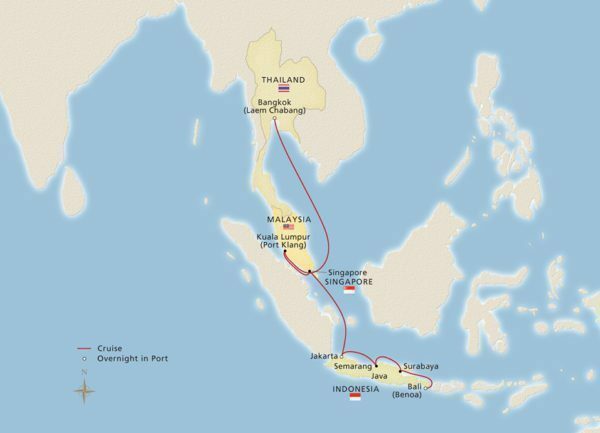 Cruise through the Strait of Malacca today. This narrow passage between Malaysia and Indonesia was long a major trade route for the earliest traders shipping glassware, precious stones, camphor, ivory and sandalwood. As you cross its historic waters, you might attend a lecture to learn about your upcoming ports. This evening, sample some regional cuisine at the World Café or at The Restaurant. Take in the breathtaking cityscapes of Kuala Lumpur, the lively capital of Malaysia. From our berth in Port Klang, you will journey to KL, as the locals call it, for a panoramic city tour with many photo opportunities. You will pass the National Museum, the huge bronze National Monument, and the National Mosque of Malaysia. Stop in scenic Merdeka Square (Independence Square), the most photographed spot in the city, and view the breathtaking Petronas Towers, resembling a pair of steel-clad docked rocket ships linked by a towering catwalk. Arrive in Singapore today. This city-state is spread across 63 islands at the tip of the Malay Peninsula and was established in 1819 for the British East India Company by Sir Stamford Raffles, after whom Singapore’s famed hotel is named. Today, it is a diverse city of varied influences, as you can see during visits to the Colonial District, Little India, Arab Street and Chinatown. Sail the Java Sea today in waters that were traversed by merchant ships from the Dutch East India Company throughout the 17th and 18th centuries. As you cruise, you will have a chance to sample some cuisine of the islands such as rijsttafel, a rice dish adopted by the Dutch and still enjoyed throughout The Netherlands. Arrive in Jakarta, Indonesia’s bustling and colorful capital, for an overnight stay. The city has been important to trade since the 4th century, and served as the capital of the Dutch East Indies during its 150-year presence here. Discover its treasures during a city tour that takes you to the National Monument, Jakarta History Museum, Wayang Museum (dedicated to Javanese puppetry), Sarinah Thamrin Plaza and enormous Fatahillah Square. Enjoy another day in Jakarta. Uncover more of its cultural landmarks on your own, perhaps pausing for a lunch of Betawi cuisine, rich in the food traditions of nearby nations. Or head up 1,000 feet to the town of Bogor to see its tea plantations and farms and explore its lush botanical gardens and safari park. Call in Semarang today on the island of Java. Stop for photos of the Great Mosque of Central Java and visit the Sam Po Kong temple, a unique Chinese Muslim temple. Alternately, venture to Borobudur temple, the largest Buddhist monument in the world and a UNESCO World Heritage Site. You may walk in the footsteps of the devout, tracing the clockwise path along its round base and climbing to its apex, where sweeping views of four volcanoes reward you. Explore the capital of East Java, central to the Indonesian War of Independence. View the Heroes Monument, then enjoy a panoramic tour that reflects the city’s diversity, from its mosques and churches to its Arab and European districts. If you prefer, you can experience local culture during a flavorful tour through the Pasar Pabean traditional market—where fresh fish, vegetables, spices and incense are traded—and to some of the city’s authentic food spots. As you cruise the waters of the Bali Sea, enjoy the amenities of your ship. You might visit The Spa for a relaxing treatment or enjoy a simple soak in the Thermal Pool. Visit Mamsen’s gourmet deli for an authentic Norwegian snack and settle in a comfortable chair in the Explorers’ Lounge to watch the seascape unfold. Or attend a colorful Destination Performance of Balinese music. Disembark in Bali today, Indonesia’s deeply spiritual island. Transfer to the airport for your flight home, or explore more during our post-cruise extension to Bali. * One shore excursion included per port as indicated (included); all others available at an extra charge. Depending on your stateroom category, shore excursions may be reserved beginning 90 days before your cruise sails. Not all excursions will be available for all sailings. Full details of the excursions available on your specific departure date can be viewed at My Viking Journey once your cruise booking has been made.